What luxuries in life do you enjoy most? Is it material possessions, such as a gorgeous home, a nice car, or a vast wardrobe? Items you worked hard for and therefore their value is more meaningful. Or how about travel? Richly rewarding in life experiences and a time set aside especially for yourself. A time to step away from routine responsibilities and deadlines. How about the smaller luxuries? The every day small moments that allow you to take a moment to be fully present. Something that is a balance to the stress, anxiety, and weariness that you experience during the week? A great cup of coffee or tea, a good book, a visit with a close friend, or a fantastic meal. Whichever of the small luxuries you enjoy the most, I believe they are important in life. Much of our daily lives seem to fly by, leaving us tired and juggling activities. The small joys perk us up and satisfy something within us. They matter. They bring about connection. Whether it’s that you felt seen and heard by that close friend, had a moment of quiet reflection over that hot cup of coffee, or were made to sit still and relax by that beautiful meal. If you’re visiting this blog, I imagine food is one of life’s true luxuries for you as well. One of the main reasons I finally created this space was to help others find a way to enjoy the small moments of life. To me, it’s not savory food, but specifically pastries that are my luxury. Not just anything sweet, but really thoughtfully created pieces. Something I know took time, skill, and heart to create. It makes it all the more special and luxurious. It doesn’t matter if you are the most talented pastry artist or a creative person at home challenging yourself to learn more and try new things. It’s special either way and the people you share it with can sense that. Eclairs are one of those small luxuries. Crisp golden pâte à choux that is stuffed with a silky robust or delicate flavored filling. The rounded tops dipped in chocolate glaze, whether white, milk, or dark and crunchy toppings arranged on top. Or, as I have done above, slice off the tops and pipe on a whipped vanilla bean mascarpone cream. These take time and effort, but the reward is worth it. Once you make pâte à choux (a classical light French pastry dough that is the base for also gougères and profiteroles- a.k.a cream puffs) it opens up a world of new flavors of eclairs to try. Your pâte à choux base will remain the same, just swap out the fillings and toppings. For the filling, I chose a strawberry rose crémeux. Crémeux literally means ‘creamy’ and is sturdy enough to use as a filling, yet soft and silky enough to not feel weighed down. You may choose to create this crémeux before your pâte à choux, as it needs time to firm up in the refrigerator or make it while the baked choux cools. One important and helpful tip for choux dough, is to keep an eye on how much of the liquid you add to your dough. The amount of heat and time you cook your dough, before adding your eggs, will determine how much moisture is evaporated from your dough. This will then determine how much liquid your dough can contain. A little food science for you, but nothing to be afraid of. Simply, check the consistency of the choux dough before adding the last little bit of egg. It should be stiff enough to hold its shape when piped. Not too stiff that it’s difficult to pipe, but not too soft that it slumps down and loses its shape. 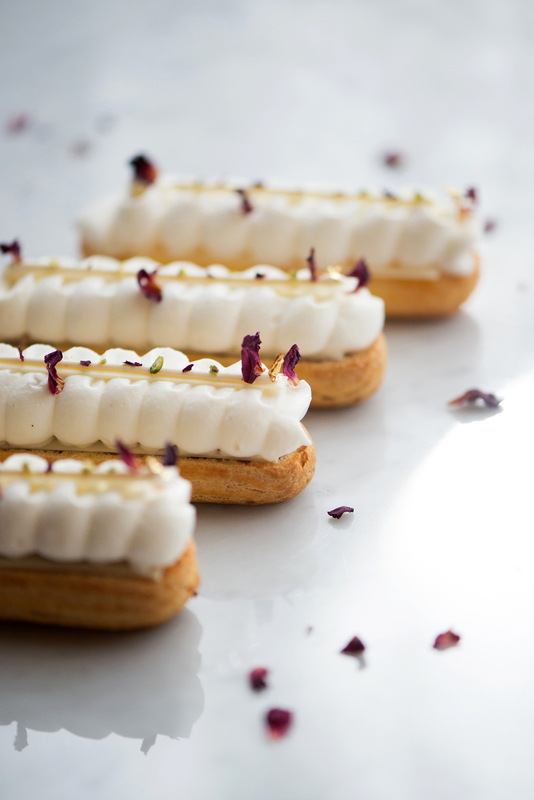 You can always freeze your pâte à choux, after piping, and bake them off later or freeze them after baking and cooled. Just pop them back into the oven to “refresh” them, until crisp once again. Prepare a stand mixer with a paddle attachment or a medium sized bowl with a kitchen spoon. Spray or wipe a flat sheet pan with oil and set aside. Preheat oven to 350F. In a medium sized pot, over medium heat, combine milk, water, salt, sugar, and melted butter. Bring to a boil, then immediately remove from heat and add both flours all at once to the mixture. Stir vigorously to combine. Once well combined, return pot to medium heat. Stir dough constantly, for 2 minutes. The dough will pull away from the sides of the pan and a thin film will form on the bottom. Keep stirring constantly to prevent browning, until the 2 minutes are up. Transfer dough to mixer bowl and on low speed mix, for 1 minute, to cool down (if using a bowl and spoon, stir for 1 minute). Add eggs in three additions, allowing each addition to mix into dough and scrape down the sides and bottom of bowl in between. Before adding your last third of eggs, check the consistency of your pâte à choux dough. You may not need all of the remaining egg, so slowly add in until the dough is shiny and firm enough to hold its shape when piped. Transfer your pâte à choux to a piping bag, fitted with a french star tip (#868). Squeeze your bag to remove any air bubbles. Pipe four inch straight lines, on sheet pan, spacing evenly to allow room for expansion between each eclair. Once you are done piping, lightly spray each line of dough with oil spray (this will help it to rise evenly in the oven). Place sheet pan into the oven and bake for 10-15 minutes or until the pâte à choux has puffed to its maximum size. 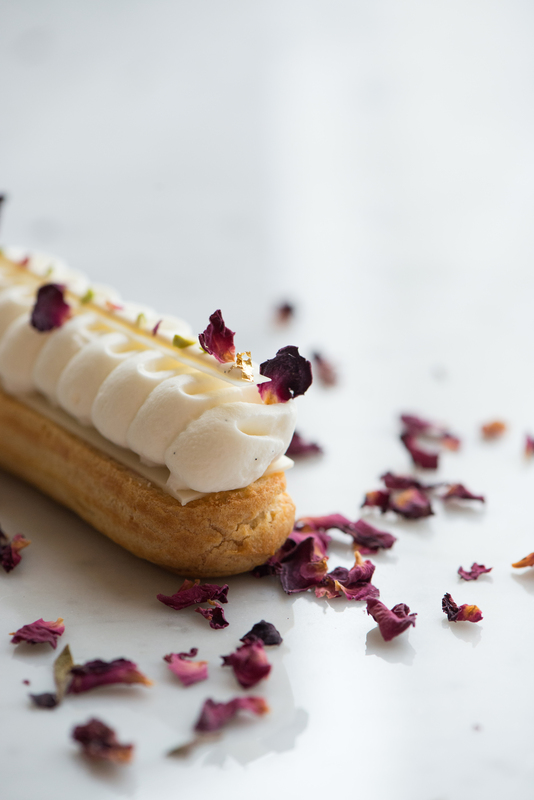 Open the oven door to release steam and gently poke each eclair with a paring knife or skewer (this will allow steam to continue to escape without bursting the eclair’s surface or creating irregular bumps on the surface). Bake for an additional 30 minutes or until eclairs are deep golden brown. Do not under bake or they will deflate after removing from oven. Remove from oven and set on cooling rack. Allow eclairs to cool completely before filing. Place gelatin sheet in very cold water and let bloom. Meanwhile, whisk together egg yolks, sugar, and cornstarch in a medium sized bowl. Set aside. In a medium size pot, stir puree and bring to a boil over medium heat. Remove from heat and carefully temper your yolk mixture by slowly pouring hot puree, in a steady stream, into the yolks while whisking yolks constantly. Do not add hot puree too quickly or you will scramble your egg yolks. Pour mixture back into pot and set back over heat, whisking constantly until thick, about 2 minutes. Remove crémeux from heat and squeeze water out from gelatin, then whisk into the warm mixture until dissolved and combined. 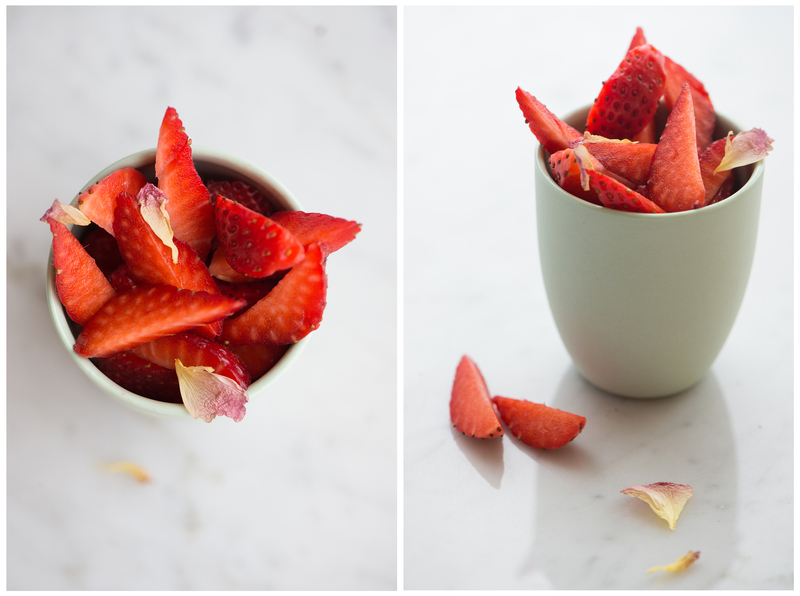 Strain crémeux into a clean bowl and set over an ice bath until cool. 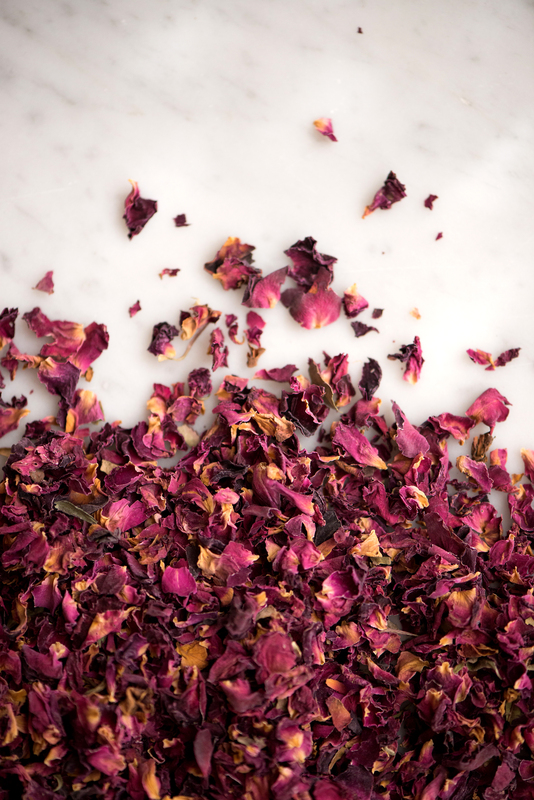 Once cool, remove from ice bath and whisk in rosewater. Cover the surface with plastic wrap and set in the refrigerator until firm and ready to pipe, up to 2 hours or overnight. 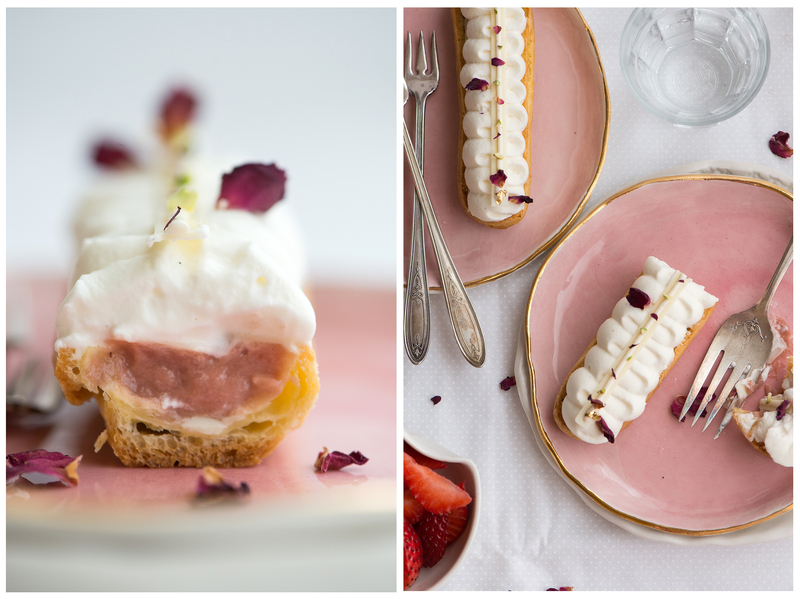 Fill a piping bag, fitted with a small round tip, with strawberry rose crémeux. Gently, poke the piping bag tip through two spots (front and back) of the bottom of each eclair. Squeeze in filling until you feel eclair is full. If you desire, you may dip the tops of the eclair into a chocolate glaze and sprinkle on any toppings you like. 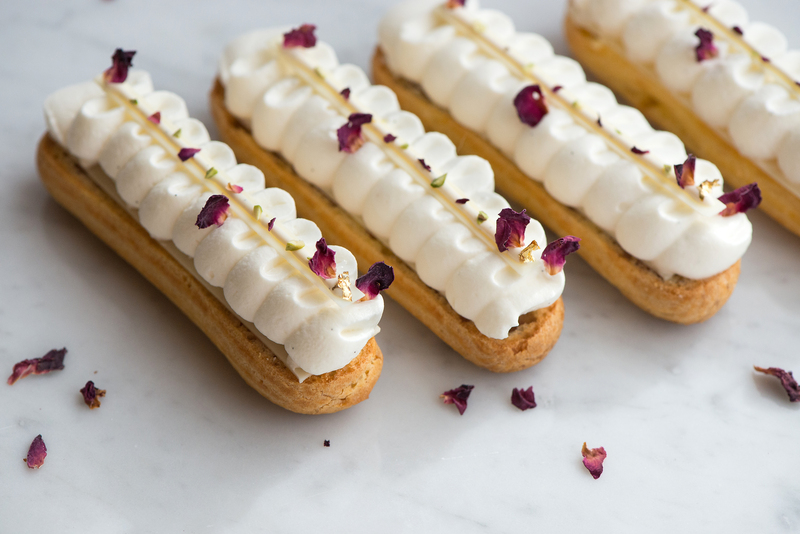 Or, if you prefer, you can slice the tops off the eclairs, fill the center, and pipe sweetened whipped cream, ganache, or any other flavored creams on top. Either way, they will be fantastic! You are so kind! Thank you, Liron. Glad you were able to stop by and enjoy those eclairs. Your recipes look gorgeous and your photos too.i wish i could have half of your talent and creativity. Just beautiful. Thank you for sharing it with us. Hi Mel, thank you for those kind words. I truly appreciate you stopping by to share with me how you’ve been enjoying Now, Forager. All the best to you and have a wonderful day! Hi Citra, thank you for such a nice compliment! Happy to know that you like them. Thanks for stopping by! Hi! I’m so excited to make this recipe and I was just wondering if you could direct me to the vanilla bean mascarpone cream recipe? Hi Livi, the whipped vanilla bean mascarpone cream is very simple. Just add seeds from a vanilla bean and a couple of generous spoonfuls of mascarpone to heavy cream. Whip it up until it’s stiff enough to pipe (basic whipped cream). Pipe it onto the eclair in any design that you’d like. Have fun! Hello, I would like to ask what kind of piping tip you have used to pipe the mascarpone cream? Hi Julia! No tip used. Simply snip the tip off of a piping bag and that’s it. Thanks for your reply! They look so beautiful.